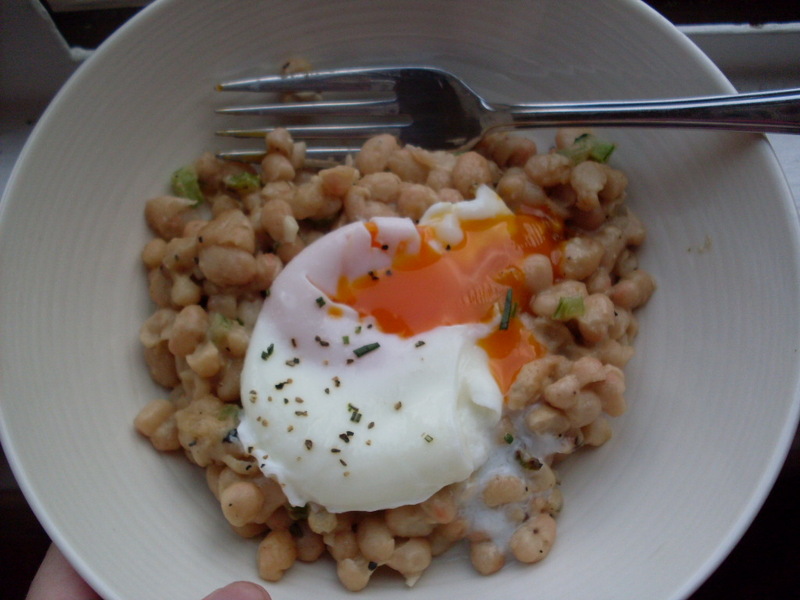 Meatless Monday: Creamy white beans with rosemary for breakfast. Nick is a sleeper. When he was a kid, he had to be shaken awake for Christmas. His alarm goes off five times before he gets up in the morning, and it is a given that he will be late for anything before 2:00 pm. His body requires a solid fourteen hours of sleep just to function. On a not unrelated note, I usually get about five hours, seven maybe on the weekend, maybe. He’s a tooth-grinder, and he’s got the jimmy legs. Breakfast used to be a thing I cobbled together out of cold crap from the fridge if I had time, but was most frequently a latte I spilled on myself as I rushed for the bus. I don’t know what Nick ate. But lately, because I’m awake anyway, I’ve been making breakfast in the morning and shoving it under Nick’s face so that he’s fed and awake and able to shower, and now we’re hardly ever late before we’ve even left the house. You might think beans are a weird thing to serve with breakfast, but trust me on this one. This dish is creamy and rich like a hearty bowl of oatmeal, but it takes less time and also contains garlic and rosemary, which oatmeal does not have going for it. Also, it takes less than five minutes, which makes breakfast something you might actually be able to achieve in the morning. Or maybe I’m the only one who battles her own will and chronic fatigue to accomplish the simplest of tasks before noon? That could well be, come to think of it. In a pan over medium-high heat, sauté celery, garlic, anchovy, rosemary, mustard, and nutmeg for about a minute, until celery is bright green and garlic is fragrant. Add beans, stir, then add cream and Parmesan. Sauté another minute, adjust seasonings to taste, and serve hot, with toast. I top mine with a poached egg. This’ll serve two people breakfast, or one person twice. It’s filling enough to get you through the morning, and it’s decadent enough to pass for a fancy side dish at dinnertime if you want. And it smells the apartment up beautifully in a way fried eggs and bacon never could. < Previous A Clambush at Desolation Sound. Next > Risotto and procrastination with currants, orange, and almonds. Oh yummy! 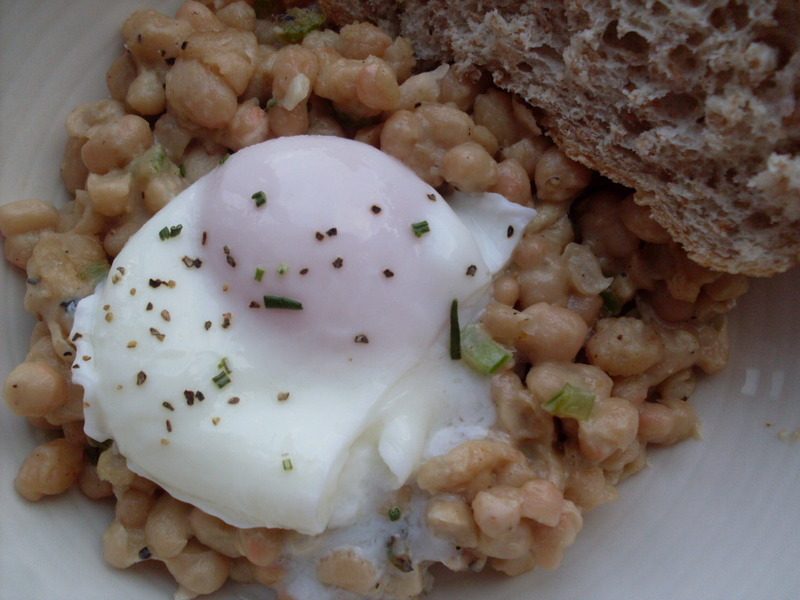 I love beans for breakfast, ever since I read that in England baked beans on toast is a popular breakfast dish. And with the gigantic rosemary bush outside whispering “feed me, Seymour,” this recipe calls to me. When we first got married, I was really distraught. We had a lot in common: hobbies, habits, high school, etc…. but what I could NOT have predicted is that Pat NEEDED 9 hours of sleep a night and had to have the house dark and quiet to get it. I had never slept more than 2 to 4 hours a night, not in my life (my mom says I shaved years off her lifespan when I was a baby). And I have the jimmy legs. I would lie awake trying not to twitch and try to amuse myself with my limited powers of imagination, desperate not to wake him up and wreck his sleep because he had Physical Fitness Training at 5 a.m. (he was a Marine) and bored out of my mind. Fast forward 15 years, and we had comfortably compromised on I-sleep-5-hours, he-sleeps-7-hours, and could stand it if I turned on lights or made noise in the house. Yay! And then I got pregnant… now I’m the one who NEEDS 9-10 hours and he is still set to 6 or 7. Poor man. I hope you make it! I’m thinking about whipping up a batch now as a bedtime snack. It’s almost healthy! Two to four hours?! I think I would implode! I think I’m fortunate in that Nick can sleep through just about anything, including violent shaking and whacking and the cat, so I can putter about while he’s in bed and it doesn’t bother him at all. Have you two tried melatonin? I can’t get enough of the stuff. I get the same amount of sleep, but it’s a more restful sleep. I haven’t tried it, but once the kiddo is here, I will. As you might guess, I’m not a very GOOD sleeper, either. I just sort of seethe and twitch, getting up to pee every half hour. Heh. look at that egg! that’s one orange locally grass fed chicken laid egg if I’ve ever seen one. Oh Canadian chickens! I kind of made this! I’m not stalking you I swear! 😀 I love your food. I host a Meatless Monday flickr group and Midnight Maniac Meatless Mondays blog carnival. I would love to have your Meatless Monday photos added to the group and welcome you to link your Meatless Monday blog posts to the carnival. The first carnival starts on October 4. Hope you will join and help spread the Meatless Monday movement! Thanks, Rebecca! I’d certainly be interested – maybe send me an email to aelwight (at) yahoo (dot) com with a bit more info?